What does it mean to major in physics? Physics is the study of the fundamental laws of nature underlying the interaction of matter and energy. It is the study of the fundamental laws of nature that govern both macroscopic and microscopic phenomena, and leads to ideas for development of new technologies and solutions to problems. Students may choose the Bachelor of Arts or the Bachelor of Science in Physics. The BA degree is ideal for pre-med and pre-professional students with a high success rate of acceptance into such programs. The BS degree is more rigorous providing training for graduate school in physics and related fields. Physics majors obtain a broad understanding of the physical laws of nature, and develop excellent skills in critical thinking, problem solving, and research. A degree in physics provides great flexibility allowing the possibility of employment in a wide variety of areas and entry to various fields of graduate study. 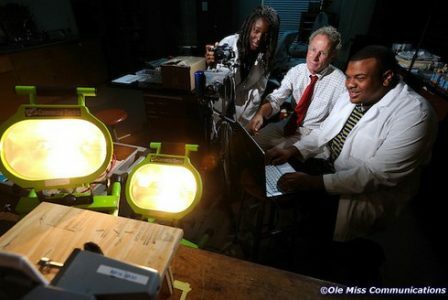 Why is the University of Mississippi a good place to study physics? There are 15 faculty with areas of expertise in atmospheric physics, (Nobel Prize-winning) gravitational physics, condensed matter physics, physical acoustics, and experimental and theoretical high energy physics. Physics majors have the opportunity to become involved in projects with faculty doing cutting edge research in acoustics, atmospheric physics, condensed-matter physics, high-energy physics, gravitational physics and astrophysics. Students receive both personalized attention and participate in some of the most exciting developments in the discipline. The acoustics program is housed in the Jamie Whitten National Center for Physical Acoustics which has the technical and support facilities of a world-class research program, including a cleanroom, a darkroom, a high-bay laboratory, an anechoic chamber, and a large open bay with subsonic and supersonic wind tunnels. The Lewis Hall Research Wing includes two parallel-computing farms. One farm consists of 68 DEC stations with associated mass storage and switching hardware and is used for reconstructions of elementary particle collisions. The LINUX farm is used for Muon Collider simulations. 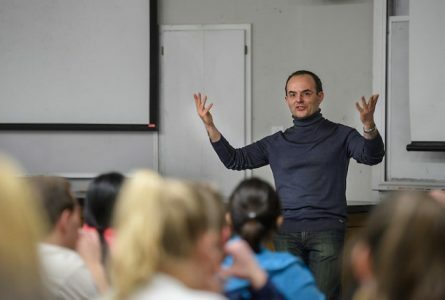 Dr. Marco Cavaglia, Professor of Physics, earned his Ph.D. at the International School for Advanced Studies in Trieste, Italy. He held postdoctoral positions at MPI für Gravitationsphysik, Germany and the Universidade da Beira Interior, Portugal. He was a Research Associate at Tufts and MIT. He specializes in detection of gravitational waves, classical and quantum gravity, cosmology, and high-energy theoretical physics. Dr. Cavaglia is a member of the Laser Interferometer Gravitational-wave Observatory (LIGO) Scientific Collaboration, whose lead researchers were awarded the Nobel Prize in Physics in 2017 for the direct detection of ripples in space-time known as gravitational waves. UM physicists and students contributed to the historic discovery confirming Einstein’s 1915 general theory of relativity. On September 14, 2015, at 4:51 a.m. EDT, scientists observed gravitational waves caused by the merger of two black holes using two identical detectors constructed in Washington and Louisiana to measure incredibly tiny vibrations of space-time. The milestone detection marked the beginning of the new field of gravitational wave astronomy. Why study physics at UM? What can UM physics majors do after graduation? A liberal arts education empowers and prepares students to deal with complexity and change through a broad knowledge of the world. They gain key skills in communication, problem-solving, and working with a diverse group of people. Related careers in physics include research & development, quality assurance, systems safety, engineering, education, medicine, business, military, energy resources, and patent law. 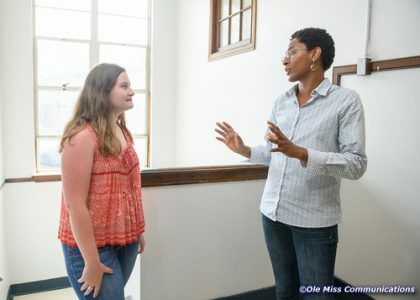 At UM, Chioma was an honors student, president of Alpha Kappa Alpha sorority, president of Increasing Minority Access to Graduate Education (IMAGE), a tutor for student athletes, and a physics teaching assistant. She had numerous research experiences: Princeton Plasma Physics Laboratory; pulmonary and critical care medicine research at Johns Hopkins that resulted in a publication; and research with faculty at the National Center for Physical Acoustics at UM – ballistic seed projection with Dr. Richard Raspet and her honors thesis with Dr. Cecille Labuda on temperature-time profiles induced by acoustic radiation force impulse imaging ultrasound exposure. After graduation Chioma attended Duke University School of Medicine where she was awarded the Howard Hughes Medical Institute Medical Fellowship and researched chemo-resistant ovarian cancer. She is currently completing an internal medicine-pediatrics residency program at Tulane University. Whom should I contact to learn more about majoring in physics?